Ironmak Machinery, tests conducted by an independent laboratory has proven our products have good mechanical properties and performance factors. 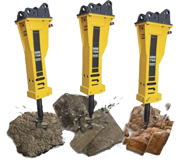 Ironmak Machinery manufacture spare parts of Hydraulic Hammers for the brands like Atlas Copco, Krupp, Rammer, Soosan, Komac, Montabert, DNB, MTB, MSB, Daemo, D&A, Fine, Mega, Indeco, OKB, JHB, Hanwoo, Seba and many other brands. Ironmak Machinery manufacture spare parts of Heavy Equipment Spare Parts for the brands like Caterpillar, Komatsu, Hitachi, Liebherr, Volvo and many others.